The Perseids are always reliable, and sometimes rather spectacular. The only things that puts a damper on the August show are bad weather or bright moonlight. Unfortunately this week, as the Perseids reach their peak Tuesday and Wednesday nights, the moon will be high in the sky, outshining the fainter meteors. Still, skywatchers around the globe will have a good chance of spotting the brighter meteors. Some already are enjoying the show. The Perseids are bits of debris from Comet Swift-Tuttle, which has laid down several streams of debris, each in a slightly different location, over the centuries as it orbits the sun. Every August, Earth passes through these debris streams, which spread out over time. "They are typically fast, bright and occasionally leave persistent trains," says Joe Rao, SPACE.com's Skywatching Columnist. "And every once in a while, a Perseid fireball will blaze forth, bright enough to be quite spectacular and more than capable to attract attention even in bright moonlight." Low numbers of Perseids, including some dazzling fireballs, have already been reported as Earth began entering the stream in late July. Seasoned observers have counted up to 25 per hour already, or nearly one every two minutes. Most meteors are no bigger than a pea. They vaporize as they enter Earth's atmosphere, creating brilliant streaks across the sky. The Perseids appear to emanate from the constellation Perseus, which rises high in the sky around midnight and is nearly overhead by dawn. Like most meteor showers, the hours between midnight and daybreak are typically the best time to watch, because that's when the side of Earth you are on is rotating into the direction of Earth's travels through space, so meteors are "scooped up" by the atmosphere at higher rates, much like a car's windshield ends the lives of more bugs than does the rear bumper. Astronomers expect up to 200 meteors per hour in short bursts of up to 15 minutes or so. But many of the fainter meteors will simply not be visible due to moonlight, and rates will go down even more for those in urban areas. More likely a typical observer under reasonably dark skies might hope to see a meteor every couple minutes when the bursts come, and fewer during lulls. The best time to watch is between midnight and dawn Wednesday. Forecasters say the best stretch could come between 4 a.m. and 5 a.m. ET (1-2 a.m. PT), which would be after daybreak in Europe. Some Perseids might be visible late Tuesday night, and Wednesday night into Thursday morning could prove worthwhile, too. Meteor forecasting is still in its infancy, however, so the best bet for anyone truly hungry to spot shooting stars is to get in as much observing time as possible from around 11 p.m. Tuesday night until dawn Wednesday, and if you miss that show, try the same time frame Wednesday evening into Thursday morning. Meteors should be visible in the pre-dawn hours, weather permitting, all around the Northern Hemisphere. "Earth passes through the densest part of the debris stream sometime on Aug. 12," said Bill Cooke of NASA's Meteoroid Environment Office. "Then, you could see dozens of meteors per hour." The best location is far from city and suburban lights. Ideally, find a structure, mountain or tree to block the moon. Then scan as much of the sky as possible. The meteors can appear anywhere, heading in any direction. If you trace their paths backward, they'll all point to the constellation Perseus. People in locations where any chill might occur should dress warmer than they think necessary to allow for prolonged viewing. Seasoned skywatchers advise using a blanket or lounge chair for comfort, so you can lie back and look up for long periods. Allow at least 15 minutes for your eyes to fully adjust to the darkness. 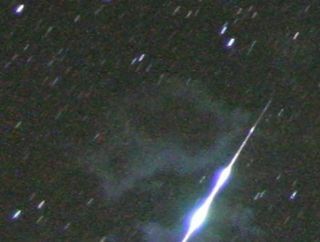 Then expect meteors to be sporadic: You might see two in a row, or several minutes could go by between shooting stars. Avid meteor watchers might want to try scanning the northeastern horizon from 9 p.m. to 11 p.m. local time (your local time, wherever you are) Tuesday and Wednesday for Perseids that graze the horizon. Cooke points out that these earthgrazers, as they are called, are rare but remarkable. "Earthgrazers are meteors that approach from the horizon and skim the atmosphere overhead like a stone skipping across the surface of a pond," Cooke explained. "They are long, slow and colorful – among the most beautiful of meteors."